Lookout, a mobile security company based in San Francisco, added a new feature to its security software on Thursday that protects web users from visiting malicious sites on Google Android smartphones. 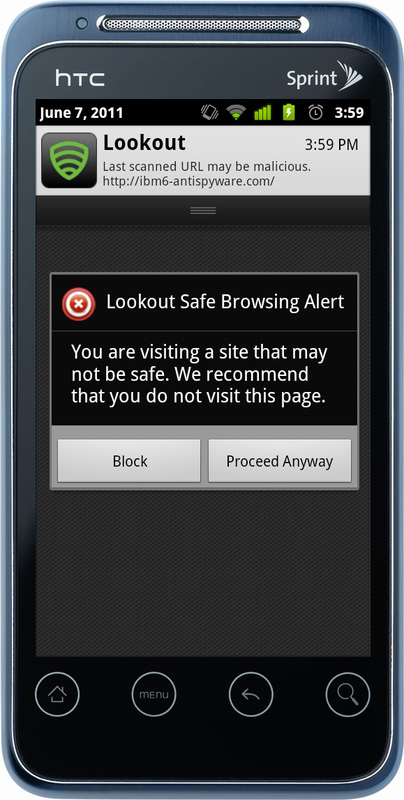 The Safe Browsing function is part of Lookout Premium, a $29-per-year service that also includes protection from malware and spyware, provides a data backup and a phone location feature. You do a million things on your smartphone. You check email, play games, visit Facebook and Twitter … the list is huge and growing. (What did we ever do without them?) What about online banking, though? Or online shopping? We know that when it comes to activities involving sensitive personal data, people are typically more cautious. For as much growth as we’ve witnessed lately in mobile web, smartphone adoption and the app store economy, we’re really at the beginning of the mobile revolution. In a world with more than 6 billion people, only 10 percent are active Facebook users, while about 20 percent use a smartphone today. That means there’s far more growth to be seen in smartphone activities and services. As that happens, smartphone users will become bigger targets for malware, phishing scams and nefarious websites. It’s worth noting that Lookout was one of the primary companies to point out a recent rash of malware apps in the Android Market back in March. Google (s goog) removed more than 50 apps as a result, but Lookout offered an update to its software that removed the malware from infected Android handsets. With little control or curation by Google, apps will continue to be a threat, but it would be a poor idea to ignore the potential negative impacts of unsafe mobile websites as consumers hit the Internet on a handheld. The company was started by John Hering, James Burgess and Kevin Mahaffey, all mobile security researchers, and now boasts 9 million users worldwide for both its free and premium service. Given the combination of a greater reliance on smartphones, the mobile web and security concerns, I’d expect Lookout’s user base to grow at a similar rate to that of smartphone adoption, if not faster.